Thank you for your interest in our company, the application process should only take you 10 minutes! 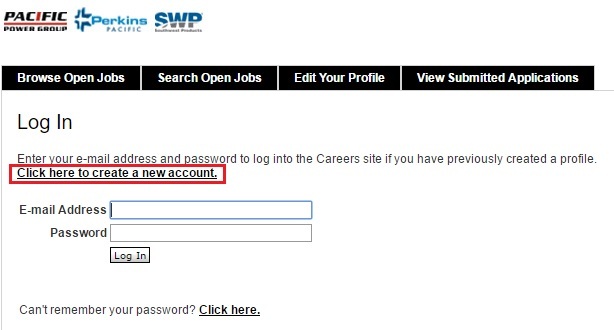 ✔ If this is your first time applying with us, please click the “Click here to create a new account” link to set up a login to begin the application process. This page is available once you click the “Continue with Application” button at the bottom of this page. ✔ We will ask you for your resume in a text box, if you have an attachment you wish to use, you can attach in the next stage. Simply put “see attachment” in the text box. ✔ The third page simply asks how you heard about the position. ✔ The fourth and fifth pages are questions we are required to ask as we are a Federal Contractor. If you do not wish to answer these questions, simple select the answer “Decline to Answer” in the drop down menus. ✔ You are done! You will see an email confirming your application has been received!